If you need more information from your customers on their return, you can ask them to print out a packing slip. You can leverage the emails and the variables to create customer-specific packing slips. If all of the information you need is already in the default emails, then you can ask your customers to just print out the email and include it in their package. You can edit your emails in your Settings, under Emails > Workflow. To create this cut-out, head to your Settings, under Emails > Workflow, and click on "Edit" on the template you'd like to edit. Click on the </> "Code View" icon. You can now see the HTML of your emails. The border-style, border-color, and padding tags allow you to style the outline of your packing slip. The border-style property can be dotted, dashed, solid, double (among other options). Click here for more details. The border-color property will accept any hex (e.g. #000000) or RGB color codes(e.g. rgb(0, 0, 0)), or HTML color names. Padding allows you to add some spacing between the border and its content. You can set it in pixels (px). The title, "Packing Slip", is made bold by the <b> tags. You can customize this. Every time you want to add a field to your packing slip, start it by <br>. The <br> tag is used to force a line-break within the <div> element. If you already have a PDF file that you want your customers to print out, fill out, and send back to you with their return, you can also link that PDF in the emails. <a href="INSERT YOUR LINK HERE" target="_blank">ENTER CLICKABLE TEXT HERE</a> and you can continue your sentence here. For an example, you can look at how the label URL is linked in the email "Return Approved: Return Label Attached". Click on the </> "Code View" icon. 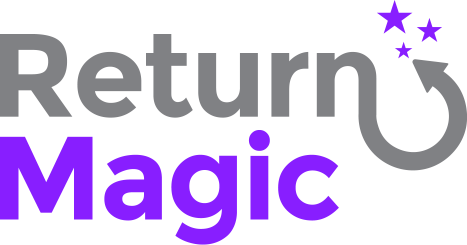 If this doesn't help, feel free to send us an email at support@returnmagic.com or comment below with any other tips or tricks you have on packing slips!